I am double excited today for a few reasons. First, I get to share with you a few pictures from our wedding. Our photographer Nate, sent these over for our one week wedding anniversary, for a sneak peek and a few teasers. I love how warm this picture looks. It was taken the day after the wedding, during our Trash The Dress session. Chris and I were facing the ocean, enjoying the sunset and sharing a joke between us. Oh how I love thee shoes. That’s all. Our wedding venue had this beach paradise on one side, then a big jungle behind it on the other side. 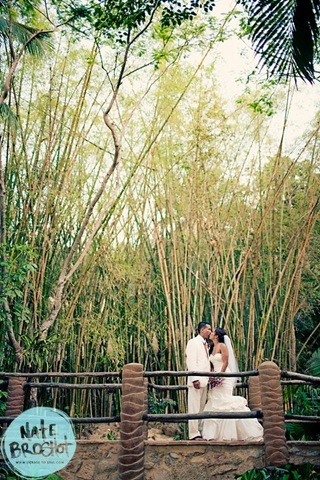 I love that this picture is so green and captures the bamboo landscape that I first noticed when we arrived. We can’t wait to see the rest of our pictures when we return from our trip. I am excited to start the wedding day recap. Second, I am excited because today we leave for our honeymoon. We have a late night flight, it will take us 16 hours to get to our destination…but it will be so worth it. We are island hopping in the tropics. I am running on few hours of sleep today, I am trying to tire myself out so that I can sleep for the first part of the flight. For the 2 1/2 weeks that we will be on our honeymoon, the blog will continue to be updated thru guests posts and other fun posts, including flashbacks and wedding DIY projects. I will be posting our shenanigans on twitter, if you want to follow me, you can find me here. ahhhhhhhh! Oh my gosh- these are so so gorgeous. I adore the first picture. Again- have a blasty! Lea, you look INCREDIBLE! The dress, the shoes, the hair. All perfect. And I love PV and the dynamic settings. Thanks Shanna. Oh and I’m glad you approve of the shoes. I am absolutely in love with that first picture. Wow! You are so gorgeous. Totally agree with Shanna. Incredible!! HAVE SO MUCH FUN! Your pictures are amazing!!! 🙂 Have an awesome trip!!! AMAZING PICTURES! All 3 capture the day so well! The bamboo shot is a very cool shot for context, the close up the next day is adorbs and your shoe pic is just so fun – great photos! HAVE FUN!!!! Absorb it all and be safe! You are so beautiful, my friend. I love everything about these photos. Sorry I didn’t send out a guest post in time! My brain was so fried. Enjoy your honeymoon! Amazing pictures!!!!!!! Can’t wait to see the rest!!! Those pictures are amazing I love them… Awesome!!! I got chills..
Ah! Beautiful! 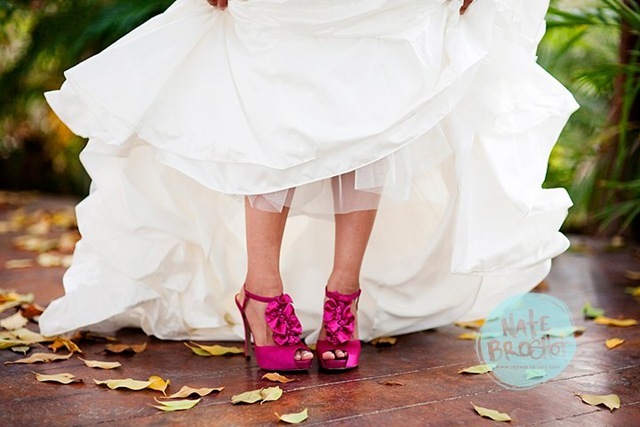 Love love love love the shoes. So adorable.